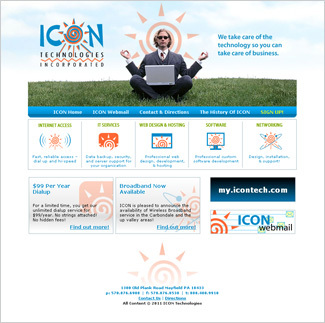 ICON Technologies provides its clients with a wide range of IT solutions, ranging from internet access and web development to networking and software development. I worked with ICON on redesigning their existing website, including the design/layout of the site and the HTML/CSS. ICON’s goal was an updated site that accurately reflected the company’s service range and IT expertise presented with a modern design that incorporated their current advertising imagery. The new design presents the content in a clean, professional layout with energetic colors and clearer navigation.